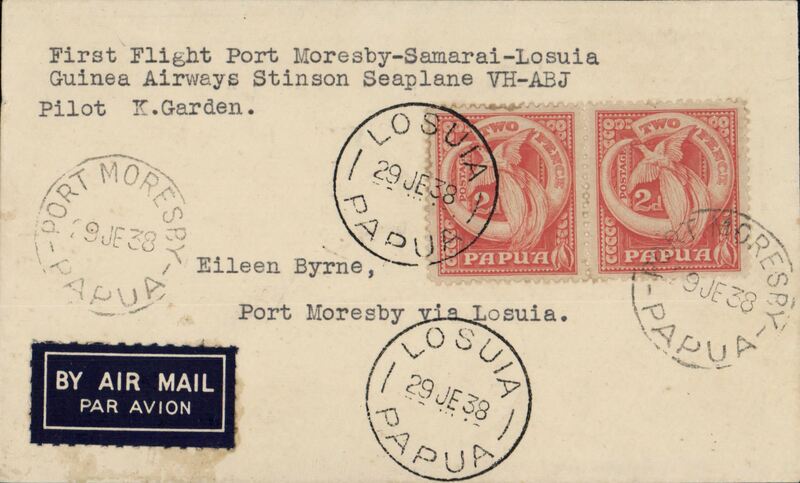 Airmail cover Port Moresby to Salamaua, franked 2d over 1 1/2d opt, 2d, and 3d 'air mail' opt, tying red/white/blue airmail etiquette. 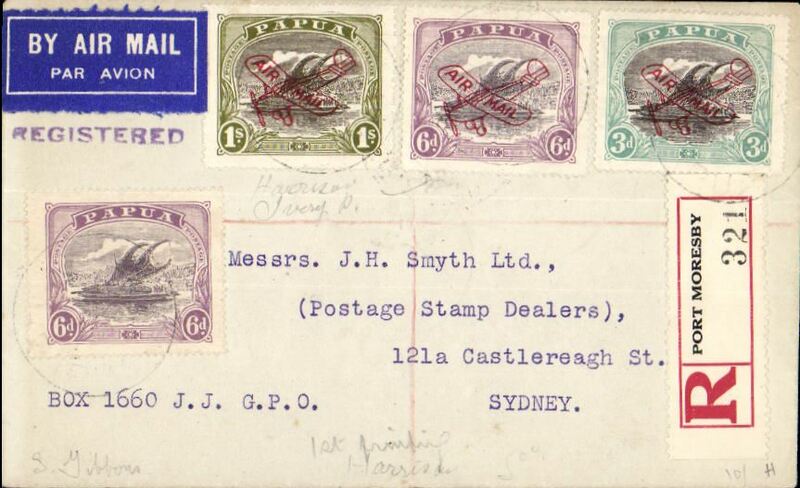 Registered (label) airmail cover, Port Moresby to Sydney via Brisbane 18/3 and Cairns 13/3, franked 1930 air opt set of 3 and 1916 6d, Francis Field authentication hs verso. 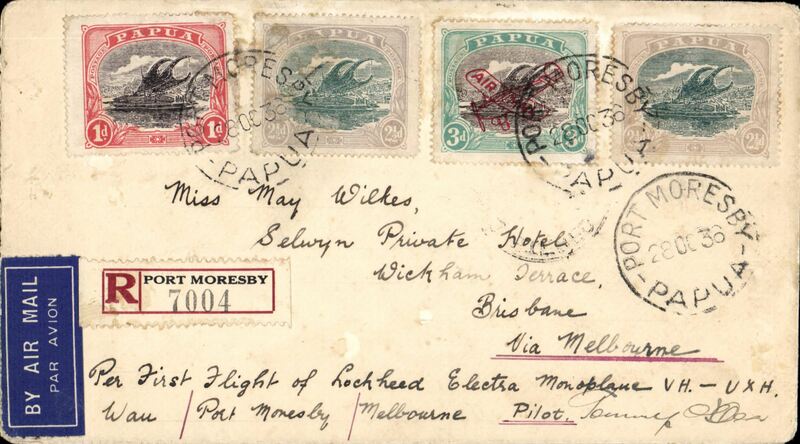 Port Moresby to Brisbane, bs 18/3, via Cairns 13/3, registered (label) etiquette cover franked 1930 opt. air set of 3, also 6d ordinary, Francis Field authentication hs verso!. 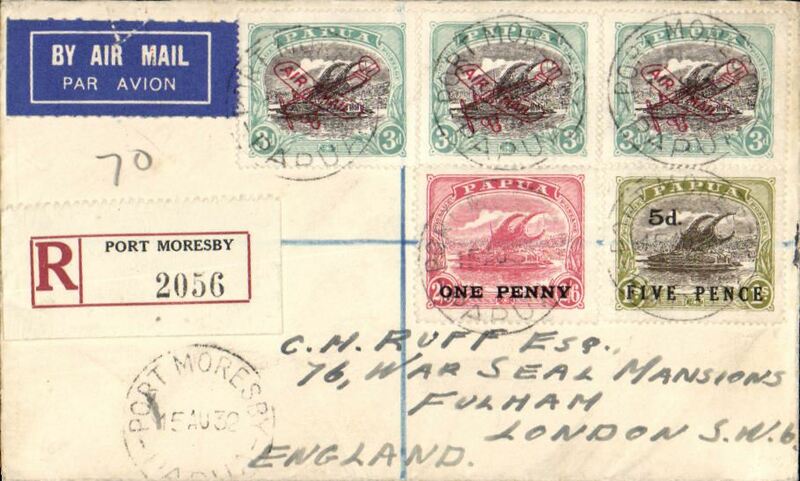 Port Morseby to New York, bs 14/9, via Brisbane 10/8 and Seattle 11/9, right half of a long commercial envelope franked 1930 air opt. set of 3 in pairs (SG 118-120) and 1929 3d air opt (SG 114). One of each of the 1930 3d and 1/- has the 'lightening flash' variation. 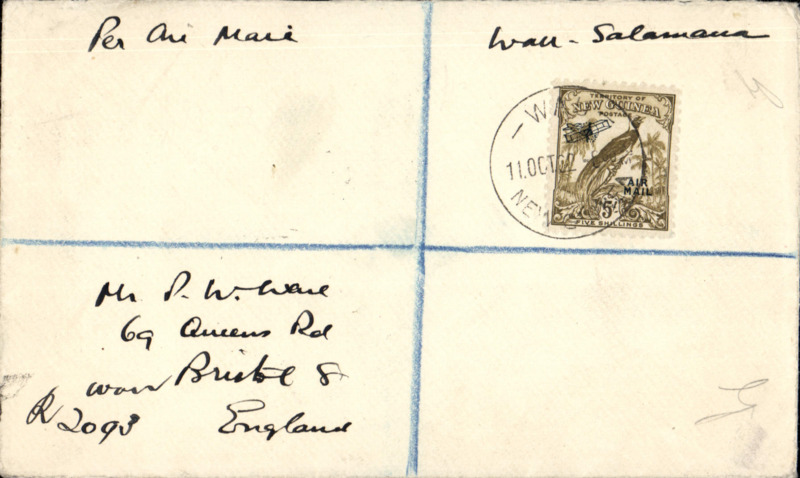 Salamoa to Wau airmail, no arrival ds, envelope, 20x26cm, franked block of 30x 1931 1/2 air with black plane and 'air mail' overprint, cat SG 30 x £3.25 = £97.50. 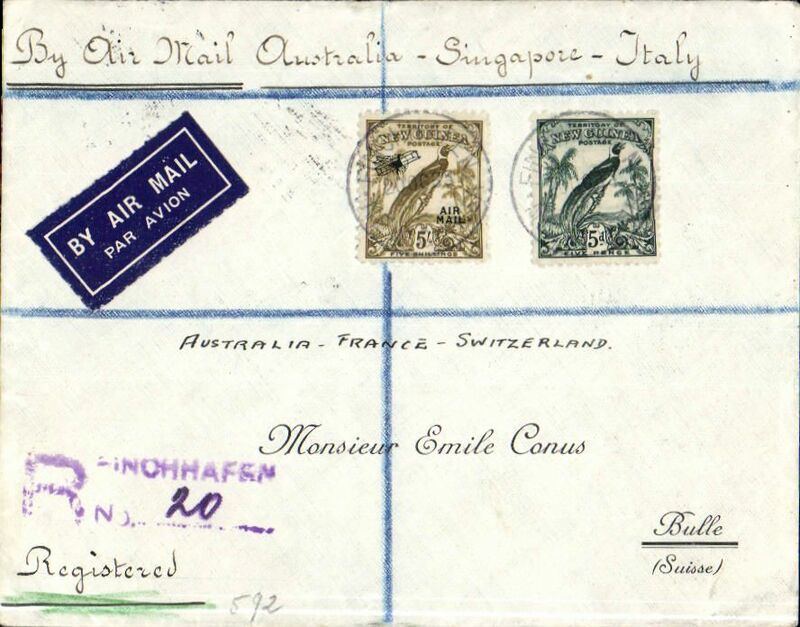 Port Moresby to London, bs 26/9, via Brisbane 22/8 and Perth 29/8, airmail etiquette registered cover franked 1/6d inc SG118xs, 125 and 109. 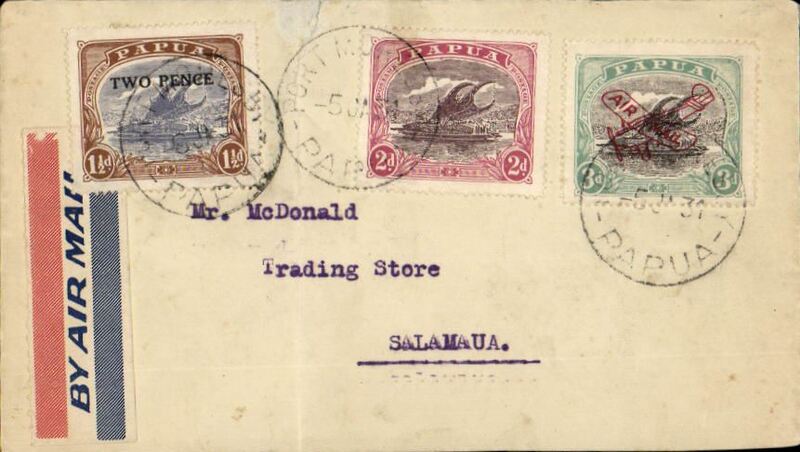 Registered airmail cover, Wau to Salamaua, franked 1931 biplane and 'air mail' 5/-, cat SG £70 used. Raboul Airways Syndicate Seaplane VH-UNY, F/F Port Moresby to Talasea, 26 Sep 1933 arrival cds on front, cover franked 3d air opt, 1d and 1/2d x2, canc Port Moresby cds, typed 'First Flight Raboul Airways Syndicate Seaplane VH-UNY/from Port Moresby to Talasea via Samarai and Salamaua'. (AAMC P66 - $300). 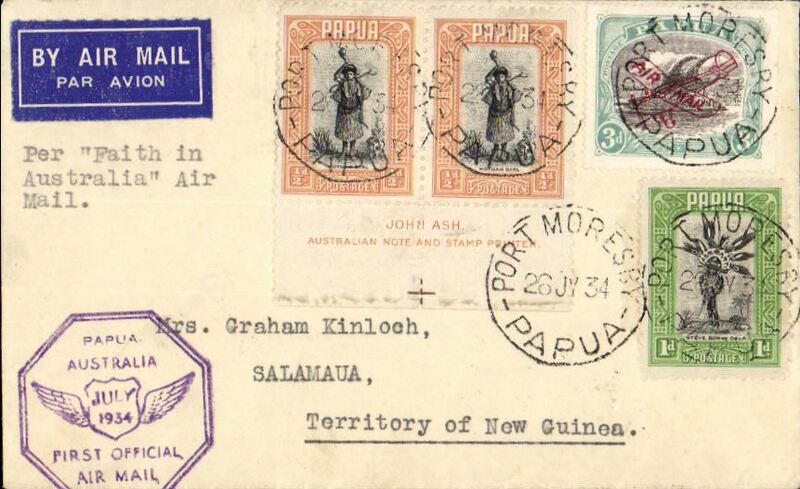 First land plane solo flight from New Guinea to Australia, Port Moresby to Townsville, b/s 13/4, registered (label) cover franked 5d and 3d air , canc Port Moresby 29 MR 34, typed "Per First Flight/Port Moresby/Townsville/Per VH-UGI Pilot Marshall", AAMC P69 $250. F/F New Guinea to Australia, Namatana 6/6, via 3/7 and Lae 30/7 to Sydney 1/8, airmail etiquette cover franked New Guinea 4d and 2d x2 Bird of Paradise stamps, purple hexagonal" New Guinea July 1934 F/F Official Air Mail" cachet, typed endorsement " per Faith in Australia ex Lae, TNG". 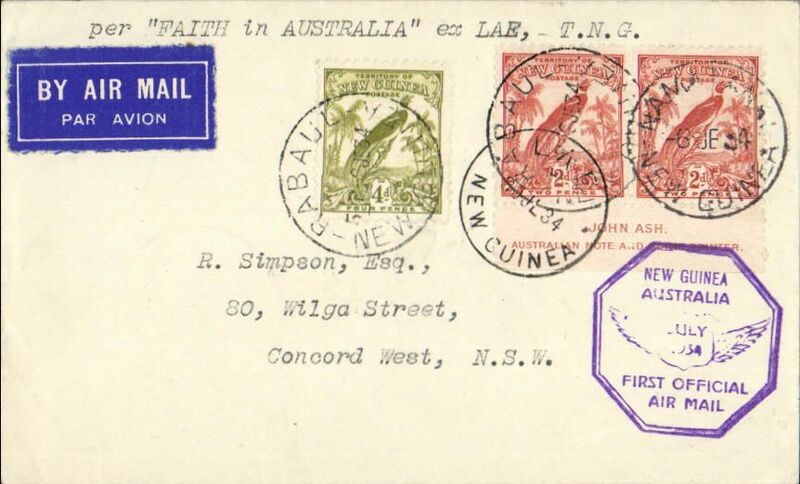 Ulm and Allan's return flight in "Faith in Australia," flown from Port Moresby to Sydney 1/8, attractive red/blue/pale blue souvenir cover with decorative border and inset picture of Commander CTP Ulm, franked 5d and 3d Papua air stamps, violet octagonal flight cachet. 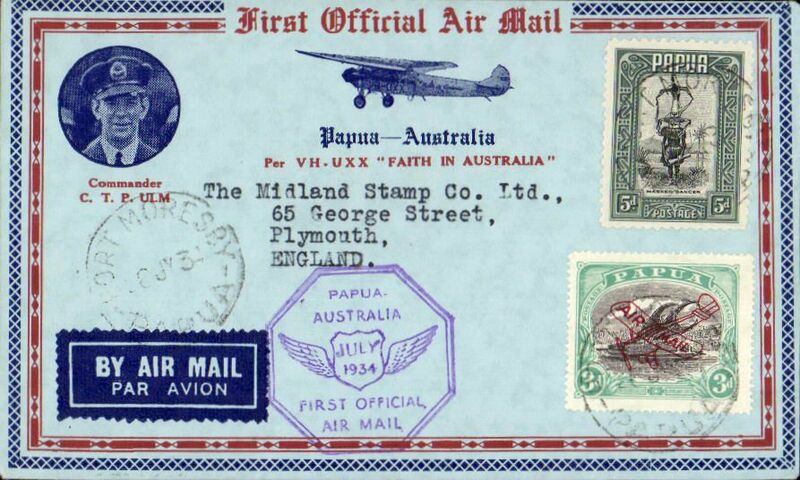 Ulm and Allan's return flight in "Faith in Australia" flown from Port Moresby to Sydney 1/8, red/blue/pale blue souvenir cover with decorative border and inset picture of Commander CTP Ulm, franked 3d and 6d Papua air stamps, violet octagonal flight cachet. 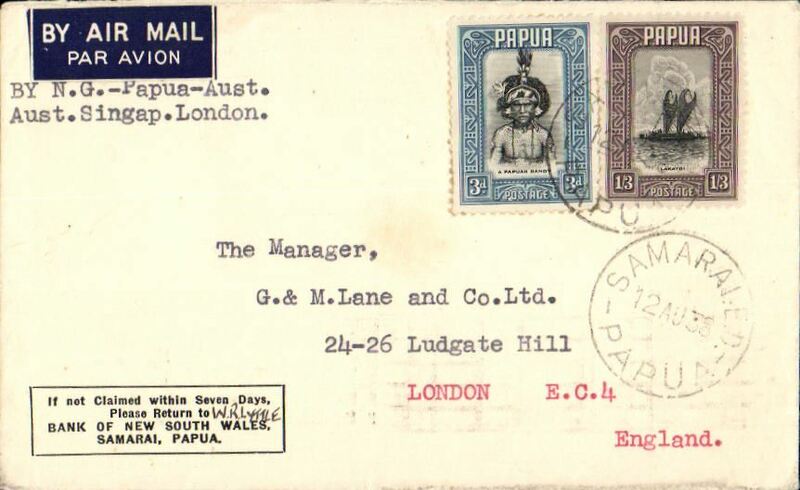 First Official Mail, Papua to New Guinea, Port Moresby to Lae, 27/7, etiquette cover franked Papua 4 1/2d and New Guinea 1932 air 6d and 2d, violet Papua/Australia and New Guinea Australia cachets. 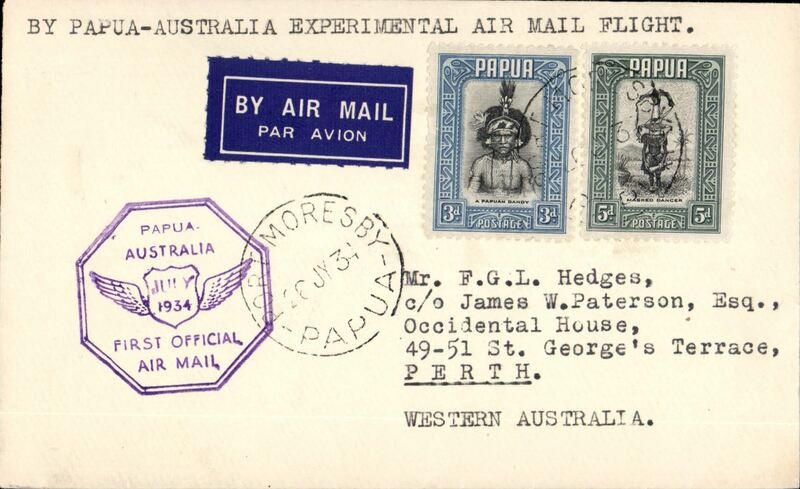 F/F Papua-Australia, PORT MORESBY TO CAIRNS, bs 31/7, etiquette cover franked 8d, violet 'Papua-Australia' cachet. 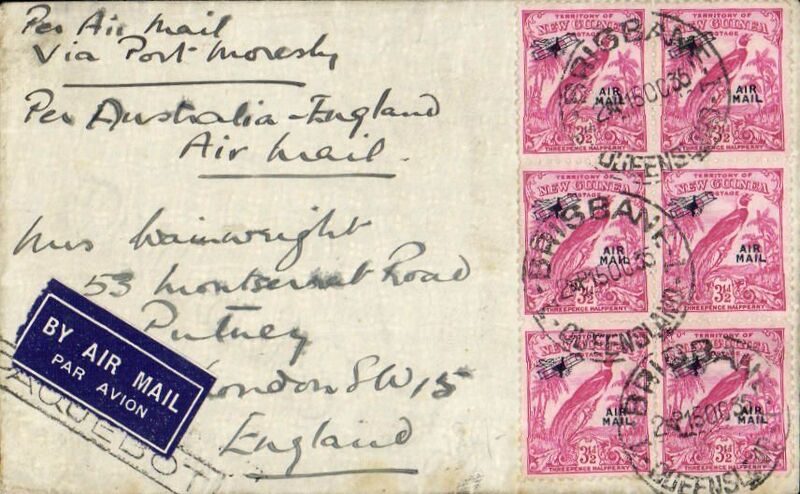 Papua to Scotland, Midlothian arrival cds on front, carried on the first official airmail from Papua to Australia, bs Sydney 1/8, etiquette cover, 21x10cm, franked Papua 1/- (SG120) and 2d canc Port Moresby cds, violet 'Papua-Australia' cachet. 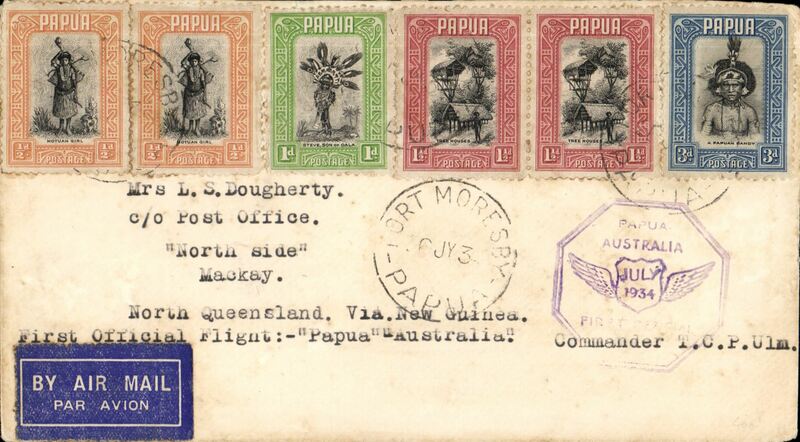 Port Moresby to Salamaua, bs 27/7, via Lae 27/7, carried on F/F Papua to Australia, airmail etiquette cover franked 5d, violet F/F cachet. 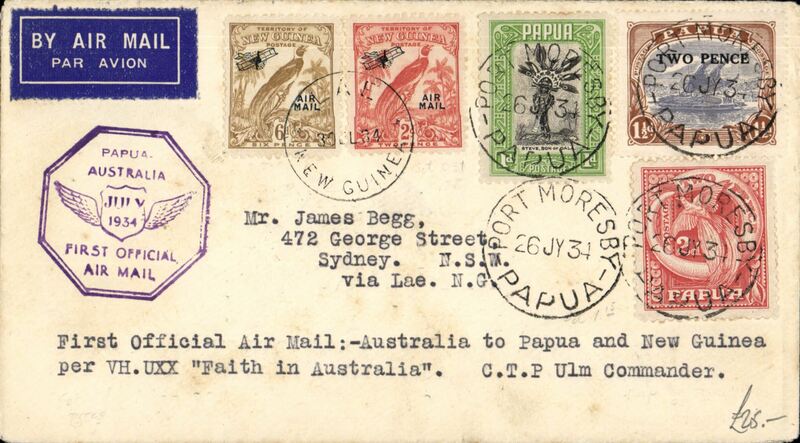 Ulm and Allan's return flight in "Faith in Ausralia" flown from ort Moresby 26/7 to Melbourne 1/8, franked 5d Papua and 8d New Guinea stamps, violet octagonal flight cachet..
Ulm, Avro X "Faith in Australia" F/F NG to Melbourne, Lae 30/7 cds, to Melbourne, bs 1/8, plain cover franked 2d x2, 4d Air Mail opts, violet hexagonal 'New Guinea-Australia flight cachet. 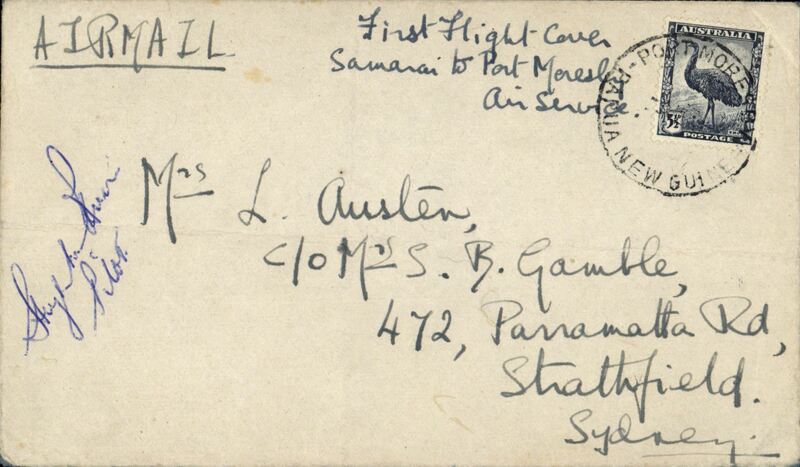 First Official Mail, New Guinea-Papua-Australia, Wau to Lae 30/7 and on to Sydney 1/8, registered (hs) cover franked New Guinea 1932 air 9d and 1/2d and 2d ordinary, New Guinea -Australia cachet. 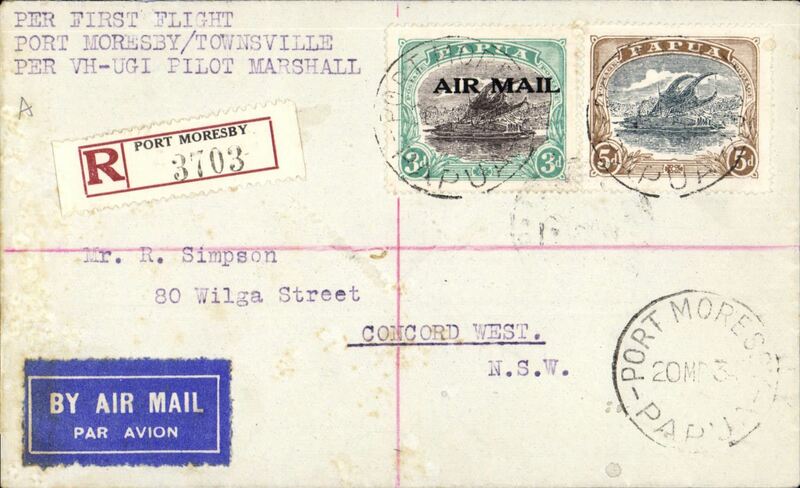 Cover posted from a vessel in the Coral Sea addressed to England, no arrival ds, via Port Moresby and Brisbane, plain cover franked New Guinea 3 1/2d (SG 194a), canc Brisbane 15 Oct 1935, black framed 'Paquebot' and ms 'Per Air Mail/Via Port Moresby/Per Australia-England/Air Mail'. 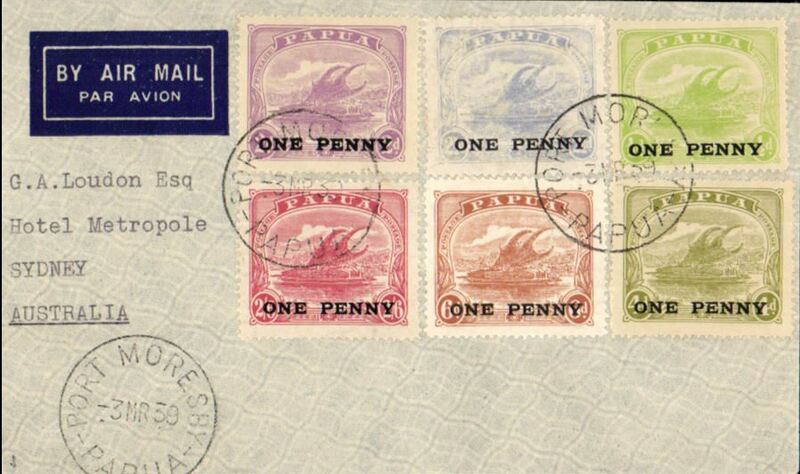 By sea to Port Moresby where airmail etiquette and New Guinea stamps were applied, the OAT to Brisbane where stamps cancelled Brisbane 15 Oct 1935 cds. An uncommon origin. NOTE at this time there was no air service from Papua or New Guinea to Australia (although there were occasional flights) as it didn’t begin until 1938. 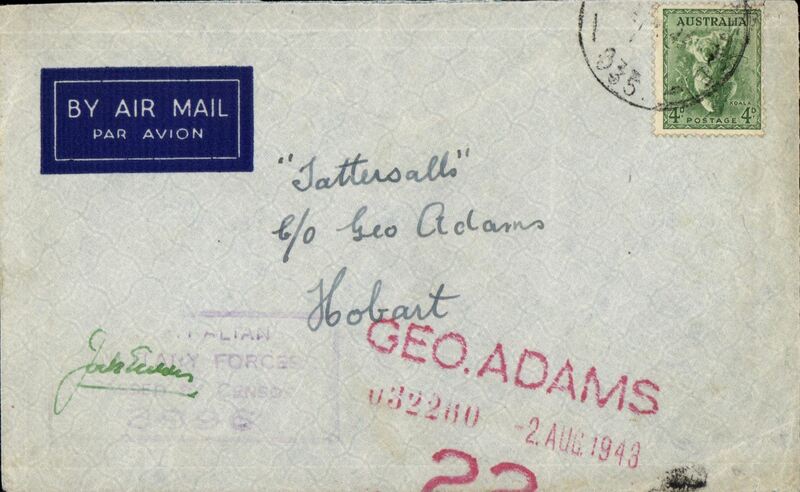 This letter would probably have gone by sea to Brisbane (a calling point for mail steamers) and from there on the Australia -UK service – the note on the back seems to suggest this. 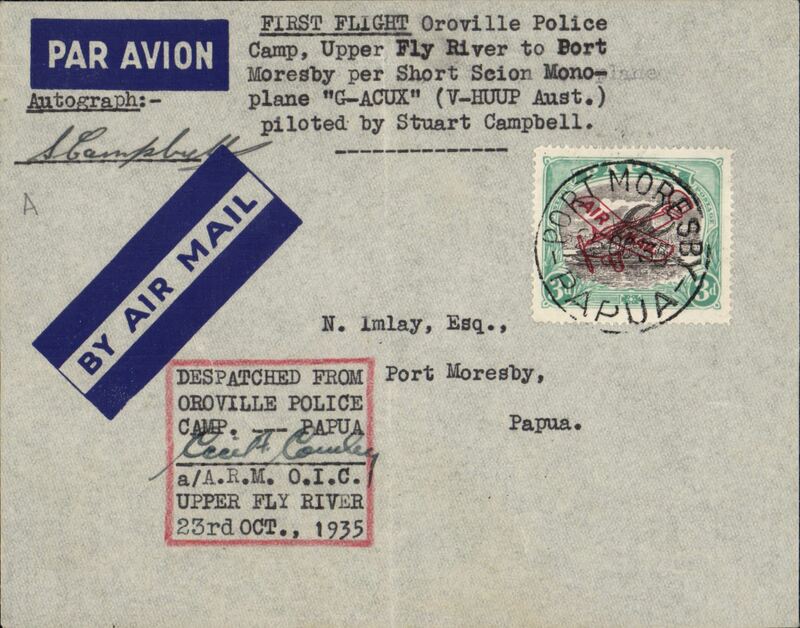 Oroville to Port Moresby, postmarked on arrival 25 Oct 35, imprint etiquette cover franked 1930 3d air opt., typed "First Flight Oroville Police/ Camp, Upper Fly river to Port /Moresby per Short Scion mono/plane 'G-ACUX'/piloted by Stuart Campbell"Pershore see on monoplane piloted by Stuart Campbell, also "Dispatch from Oroville Police Camp confirmed by 'ms' Cecil Connolly a/A.R.M. O.I.C.UPPER FLY RIVER 23rd October 1935", Signed by the pilot Stuart Campbell. AAMC P91 $350. A nice item in fine condition. Guinea Airways Lockheed Electra flight, Port Moresby to Melbourne bs 30/10, registered (label) cover franked 1916 1d, 2 1/2d x2 and 1930 3d air. Signed by the pilot Tommy O'Dea. Nice item. 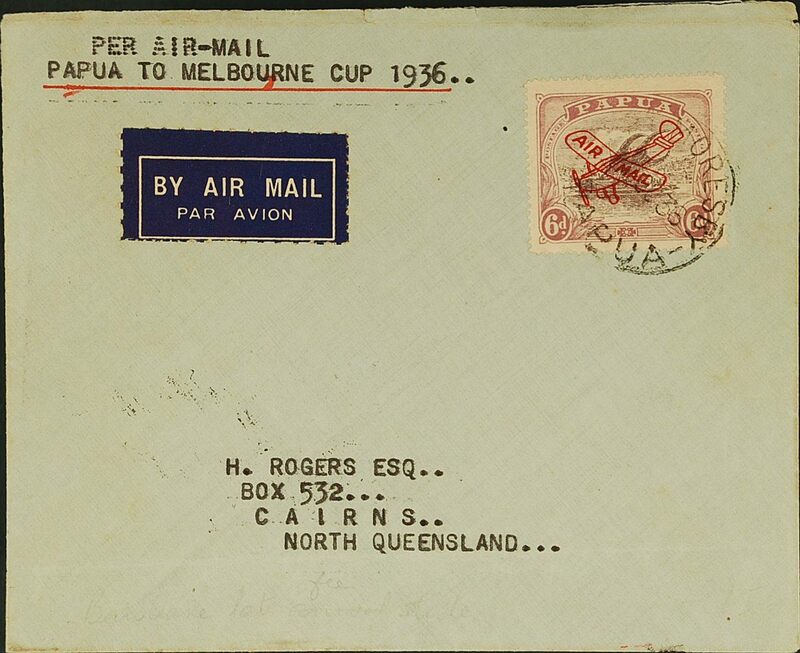 Guinea Airways Lockheed Electra special flight to the Melbourne Cup, Port Moresby to Australia, bs Brisbane 29 OC 36, airmail etiquette cover franked Papua 6d air, canc Port Moresby/Papua cds, typed "Per Airmail/Papua to Melbourne Cup 1936". 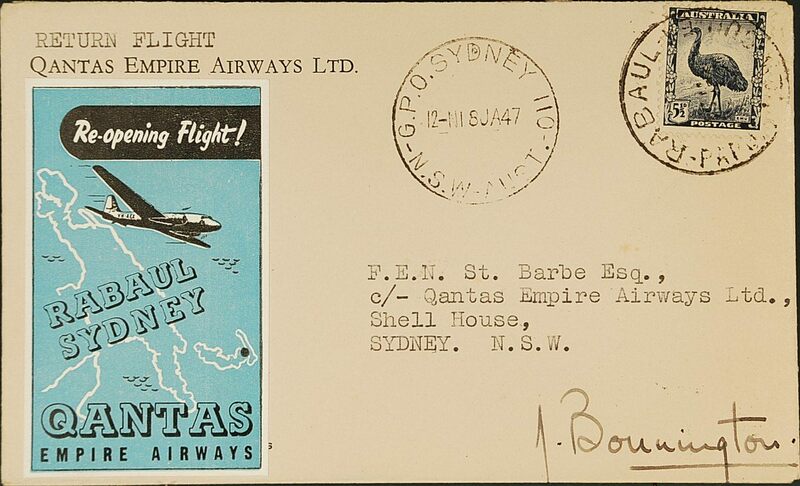 Guinea Airways Lockheed Electra special charter flight to the Melbourne Cup, (Wau)-Port Moresby-Melbourne, bs 30/10, registered (label) cover franked 1930 3d and 6d air opt, canc Port Moresby 28 Oct 36, typed 'First Direct Flight/Wau-Port Moresby-Melbourne/ Lockheed Electra monoplane, signed by the pilot Tommy O'Dea. Also B&W photograph of mail bags being loaded into the Lockheed. Guinea Airways Junkers Seaplane VH-UNM, F/F Lake Kutubu to Port Moresby, plain cover franked 2d, canc Port Moresby cds, typed 'First Flight Lake Kutubu to Port Moresby via Kikori', delayed arrival at Port Moresby endorsed by Ivan Champion, Asst District Commissioner, signed by the pilot Aubrey Koch, only 17 covers carried, AAMC P121 $600. A scarce item in fine condition. 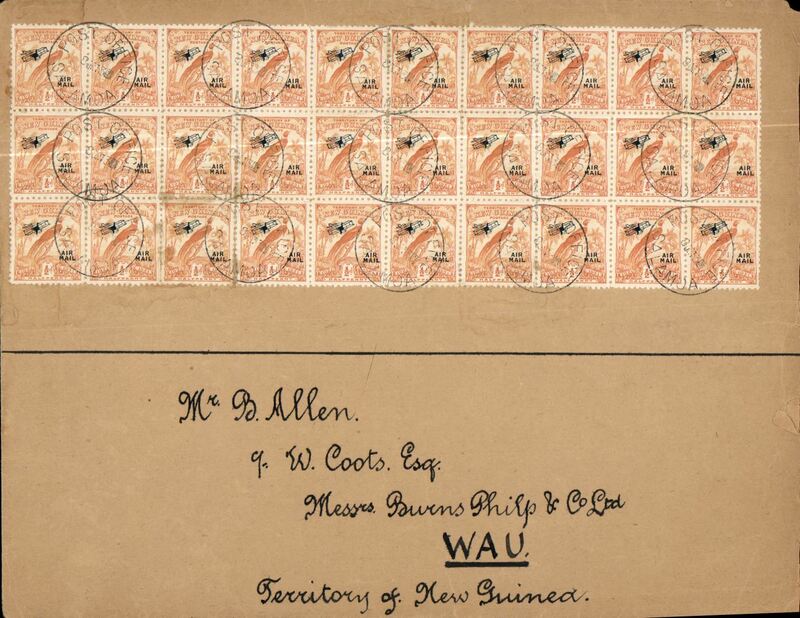 WR Carpenter Airlines, F/F New Guinea to Australia, bs Sydney 5/6, airmail etiquette cover franked New Guinea 2d & 3d air stamps, canc Wau 3 Jun cds and Salamau 4 Ju 38 cds, also uncancelled Australia 5d, typed "Ne Guinea-Australia/Air Mail Service/Inaugural Flight". 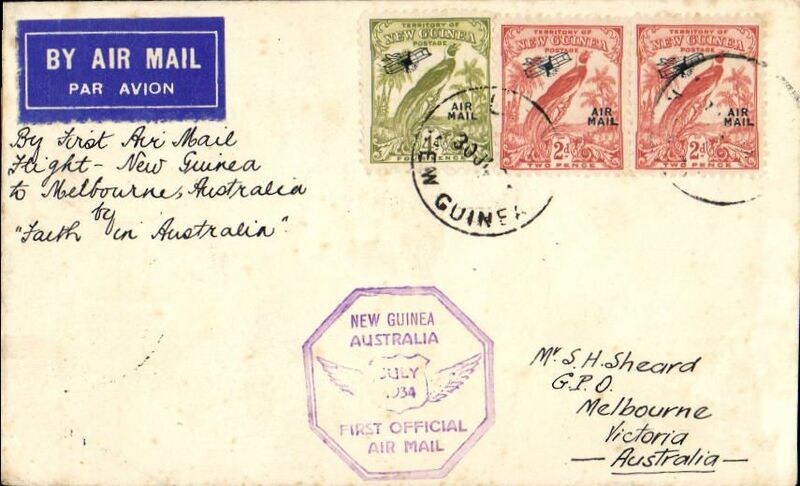 WR Carpenter Airlines, F/F New Guinea to Australia, bs Brisbane 6/6, attractive Standard Stamp Co Brisbane cover with Union Jack and Australian flags etiquette cover franked New Guinea 2d & 3d air stamps + 3d ordinary, canc Rabaul 2 JU 1930 cds, violet framed 'First Reg. Flight/Australia-Papua-New Guinea'. 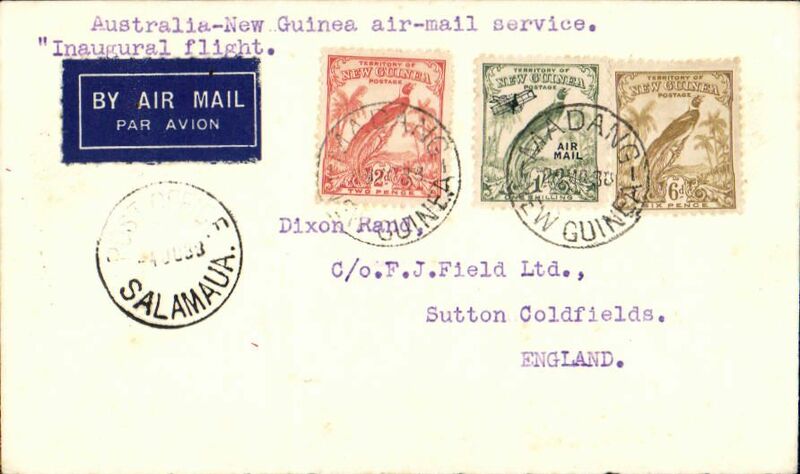 WR Carpenter Airlines, Mandang to England, bs 17/6, via Brisbane 5/6, carried on 1st official airmail service between Australia-Papua and New Guinea, and on to GB, plain cover franked 1932 2d & 6d ,and 1/- with biplane and Air Mail, cancelled Mandang, Salamauau 4/6, Brisbane 5/6 and Birmingham 17/6. Ironed vertical fold, does not detract - see scan. 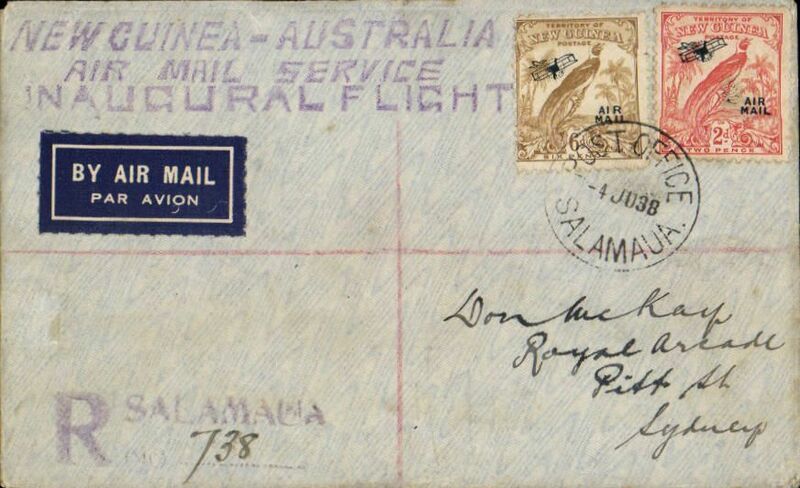 WR Carpenter Airlines,Salamaua to Sydney, bs 6/6, carried on 1st oficial airmail service between Australia-Papua and New Guinea, reg (hs) cover franked 6d & 2d with biplane and Air Mail, postmarked Salamaua 4/6, large three line "New Guinea-Australia/Air Mail Service/Inaugural Flight" cachet. 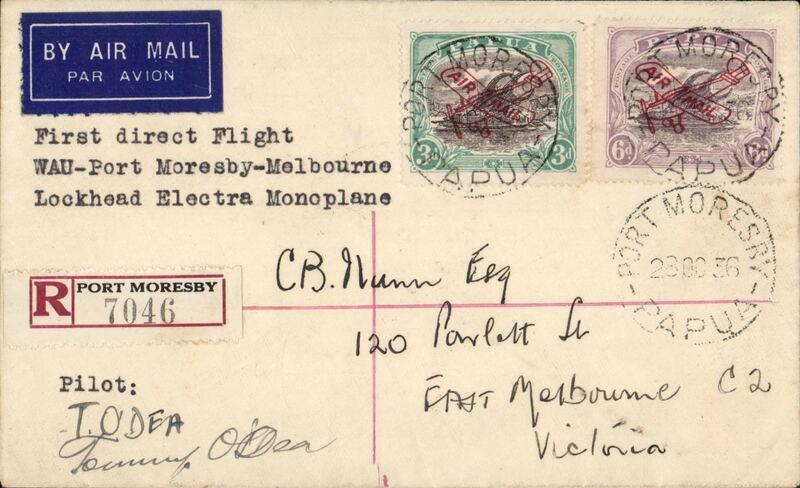 WR Carpenter Airlines, scarce franking, Rabaul to Sydney, bs 5/6, carried on 1st official airmail service between Australia-Papua & New Guinea, OHMS cover, 27x14 cm franked 1925 6d & 2/- with 'OS' opts (SG O37 & O40, cat £87 used), typed 'Inaugural Flight'. dark blue/white airmail etiquette. 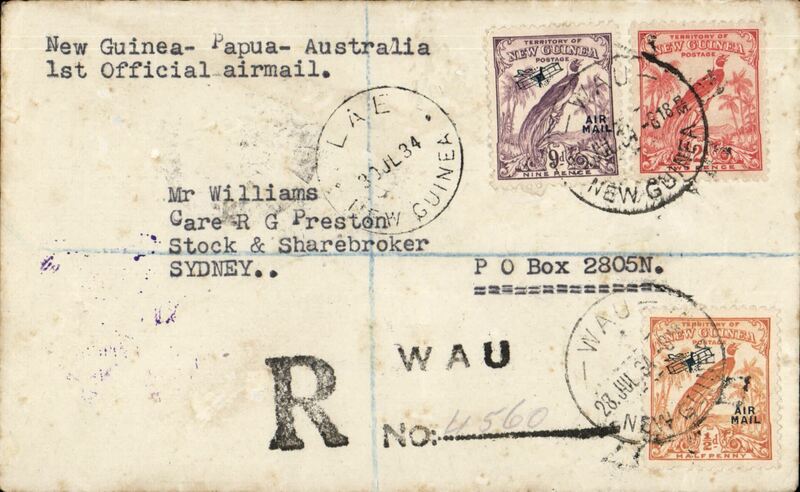 WR Carpenter Airlines, first official flight Wau 3/6 -Salamau 3/6 to Sydney 5/6, and return Sydney 7/6 to Wau 9/6, plain cover, 20x10cm franked 1/2d PNG stamps and 5d Australia stamps for the return, fine strike violet st. Line "W.R.Carpenter & Co. Ltd." hs verso. F/F covers from Wau are uncommon. Guinea Airways Stinson 'Reliant' seaplane, F/F Port Moresby-Samarai-Losuia, 29 JE 38 arrival cds on front, airmail eiquette cover franked 2d x2, canc Port Moresby 29 JE 38, typed " First Flight Port Moresby-Samarai-Losuia/Guinea Airways Stinson Seaplane VH-ABJ/pilot K. Garden". AAMC P136 $250. 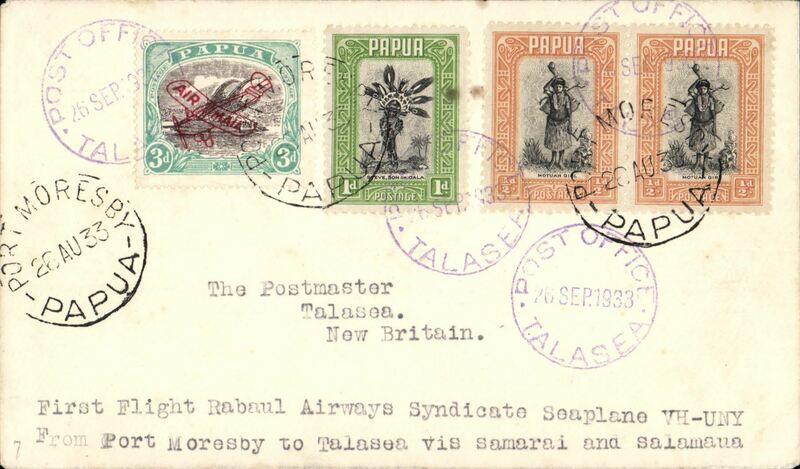 Papua to London, carried on first return WR Carpenter Airlines New Guinea-Papua--Sydney, viaTownsville 20/8, etiquette cover franked 3d and 1/3d Papua stamps canc Samarai E.D./Papua/12 AU 38, typed 'By N.G. -Papua-Aust-Singap.London'. 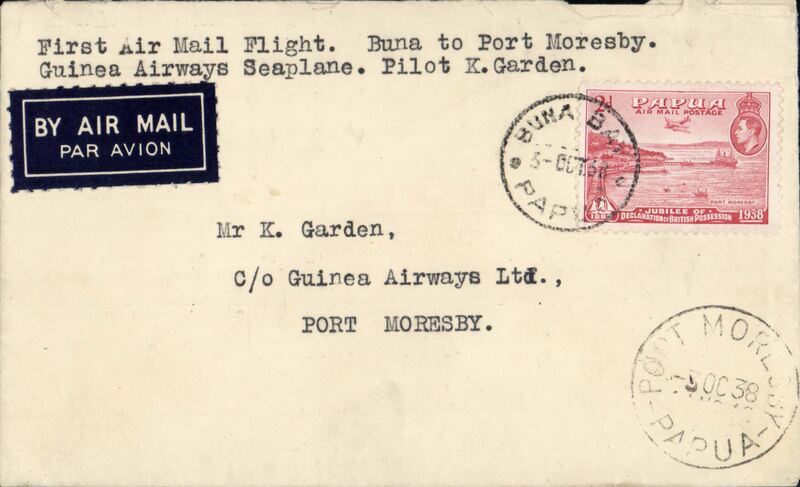 Guinea Airways Stinson 'Reliant' seaplane having force landed at Buna Bay uplifted a small mail for Port Moresby, airmail etiquette cover franked 2d, canc Buna Bay 3 Oct 38 cds, Port Moresby 3 Oct 33 arrival ds on front, typed 'First Air Mail Flight, Buna to Port Moresby/Guinea Airways Seaplane, Pilot K.Garden. AAMC P139 $325. 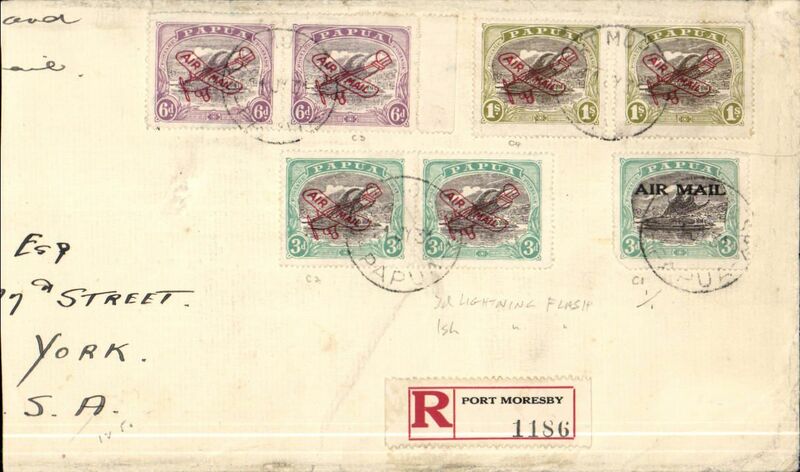 Port Moresby to Sydney, imprint etiquette airmail cover franked 1917 1d opt set of 6. 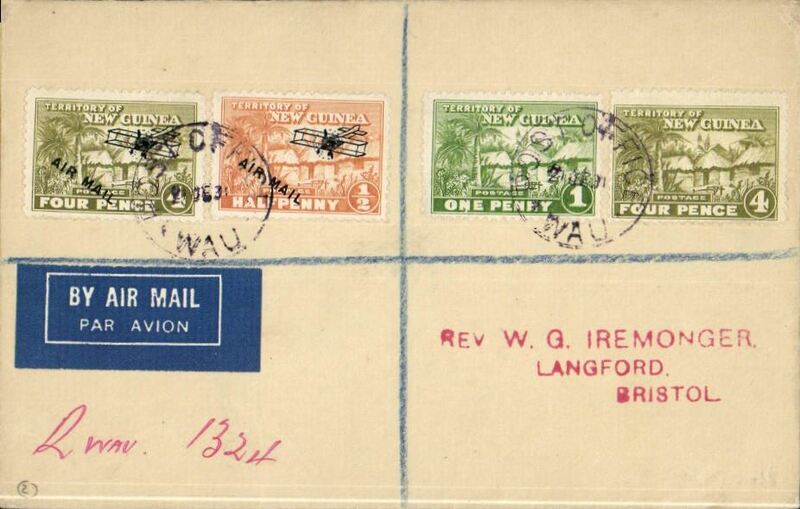 Registered (hs) air cover to England, no arrival ds, franked 1/2d, 1d,1 1/2d, 2d and 3d vals of 1939 air set, canc Bulolo cds, Salamaua 19/5 transit cds. 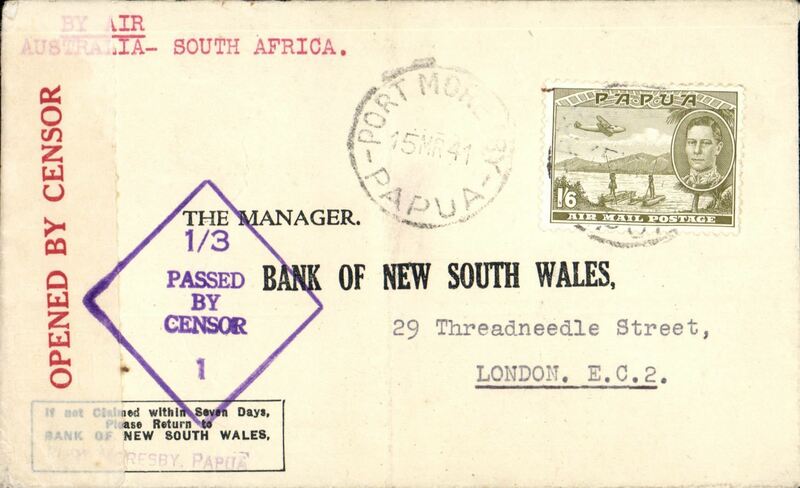 Empire airmail Horseshoe Route (10/6/40 to 8/12/41), Port Moresby to London, by air to Durban, then by sea to GB, printed bank corner cover correctly rated Papua 1/6d canc Port Moresby 15/3/41 cds, typed 'By Air/Australia-South Africa', sealed Australia red/white OBC censor tape tied by violet '1/3/Passed By Censor/1' censor mark. Nice example. Airmail sent from Australian Armed Forces serving in Paua to Hobart, imprint airmail etiquette cover franked Australia 4d, canc *****035**(? Morotai), violet framed 'Australian MIlitary Forces/Passed By Censor/3996' signed censor mark. 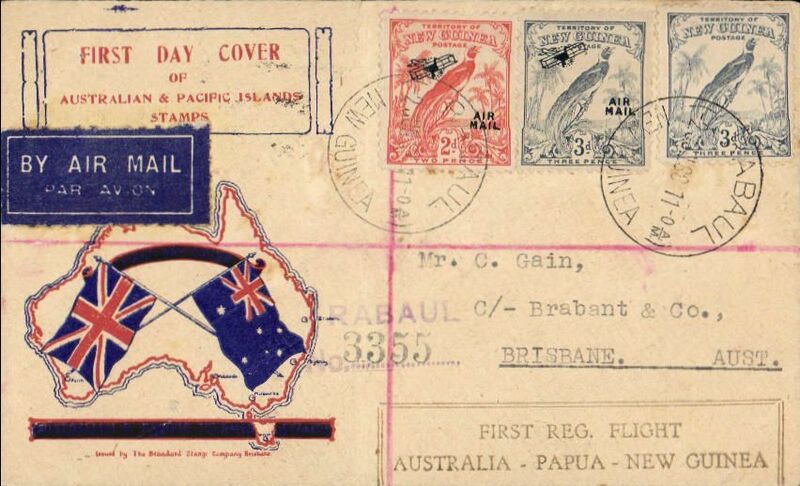 During WWII Australian Forces serving ib Paua were allowed to use Australian stamps. 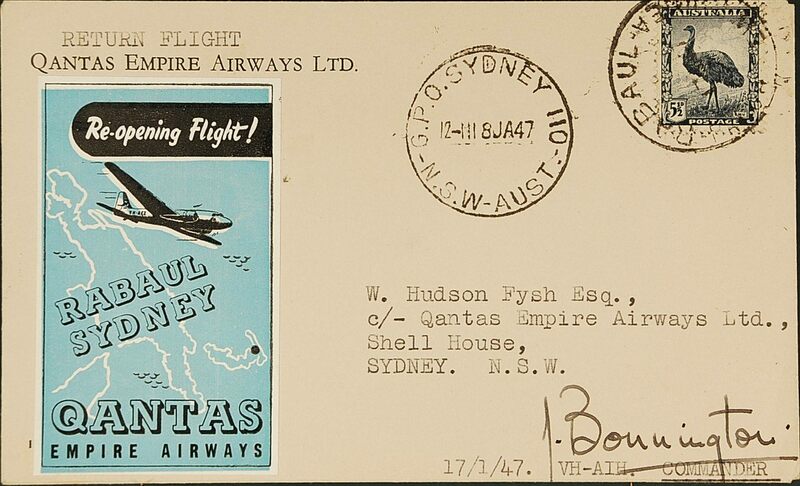 Qantas return flight Rabaul to Sydney,18 Jan 47 arrival ds on front, blue 'Rabaul-Sydney' vignette, signed by the pilot Capt JA Bonnington. 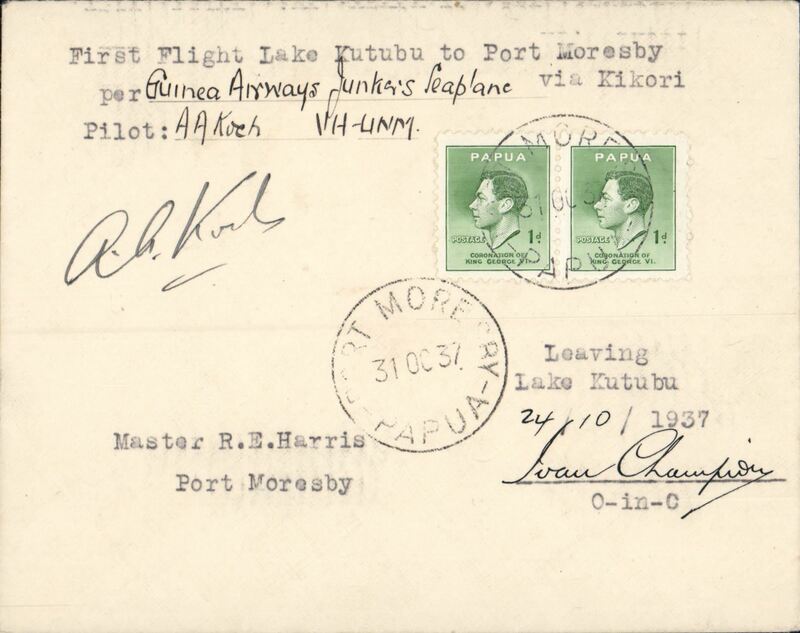 F/F Qantas Catalina flying boat service, Samarai to Port Moresby, cover franked 5 1/2d, canc Port Moresby cds, day, month and year largely illegible, ms "First Flght cover/Samarai to Port Moresby/Air service", signed by the pilot Captain Hugh M. Birch. Hugh Milton ‘Smokey’ Birch DFC was the first pilot to inaugurate Qantas flying boat flights throughout the Pacific and he also pioneered the Catalina flying boat service from Sydney (Rose Bay) to Lord Howe Island. F/F Qantas Catalina flying boat service, Deboyne Lagoon (Milne Bay) to Bwagaoia (Misima Island), airmail etiquette cover (22x10cm) franked 4x3d POA with fine strikes Bwagaoia 2 JE 49 cds, typed "First Catalina Air Mail Service/from Deboyne Lagoon, South/Eastern Division Papua", violet 'Bwagaoia-Misima' hs. 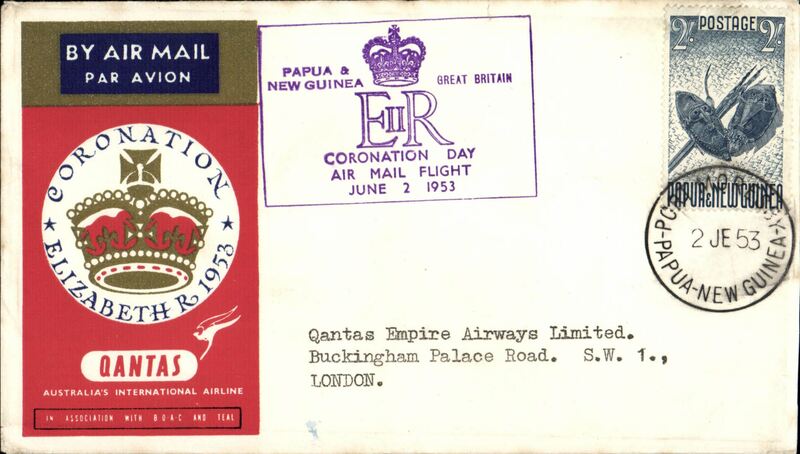 Coronation Day Air Mail Flight, Papua to London, bs 6/6, souvenir cover franked 2/-, framed violet flight cachet. 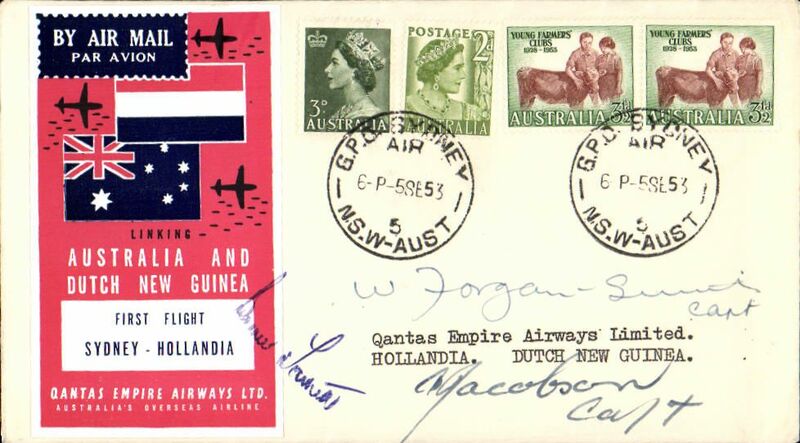 Qantas DC3 return flight Hollandia to Lae, bs 8/9, superb red/white/blue Qantas vignette, one of only 300 issued specially for the flight, and tied by the signature of the pilot Capt. J.B.Fawcett, also signed by Captains W. Morgan-Smith and A. Jacobson. 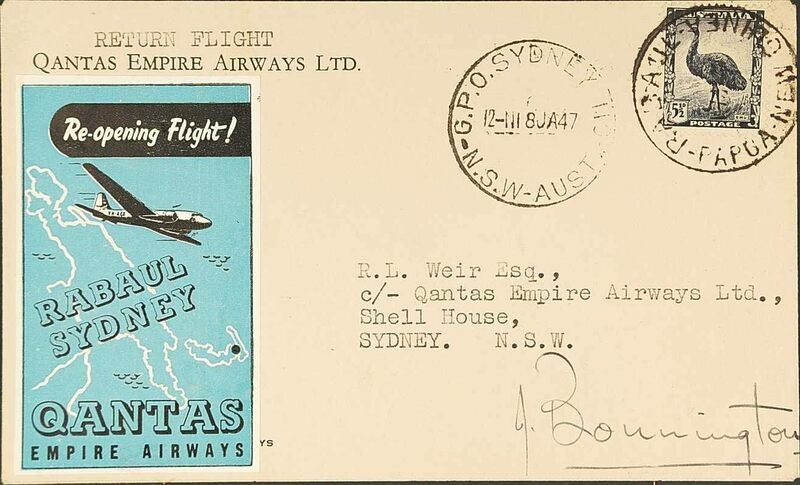 An almost identical cover is illustrated in Fromer's Australian Air Mail Labels and Vignettes, 1920-1960. Lovely item. 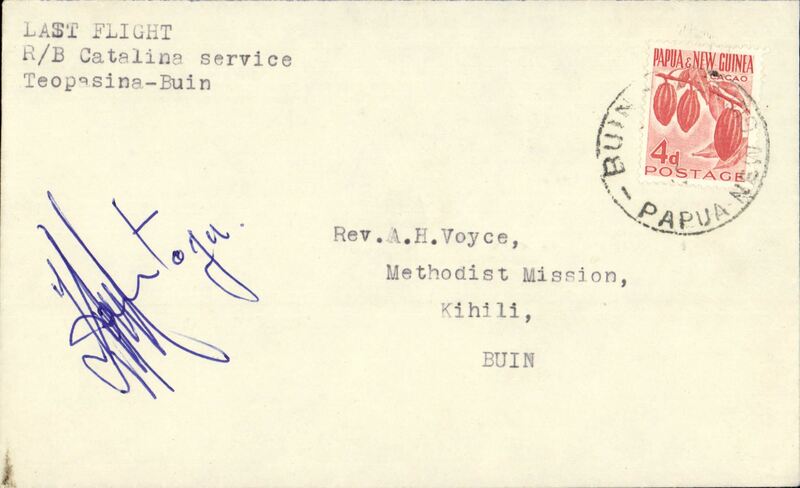 Catalina Flying Boat Service, missionary cover addressed to Buin, franked 4d, weak POA 'Buin/New Guinea/10 JE 57' cds, with manuscript 'Per M.R. Catalina Service/Teopasina-Buin' at left. and signed by the pilot Captain Meredith/F.P. Catalina. Buin and Teopasina are towns on Bougainville Island, in eastern Papua New Guinea. 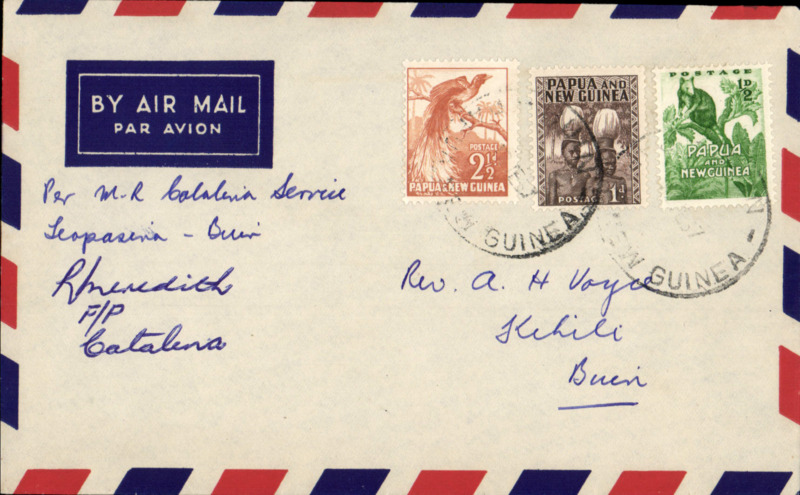 Last flight of the Catalina Flying Boat Service from Teopasina to Buin, cover addressed to Buin, franked 4d, weak POA 'Buin cds (date illegible) with typed 'Last Flight/R.B. Catalina Service/Teopasina-Buin' and signed on the front by the pilot Captain K.A.Montagu, with names of crew members listed verso. Also verso are two ms dates in pencil '23/7/58', and 'see Rev A.H.K.Lester 22/5/59'. Buin and Teopasina are towns on Bougainville Island, in eastern Papua New Guinea. 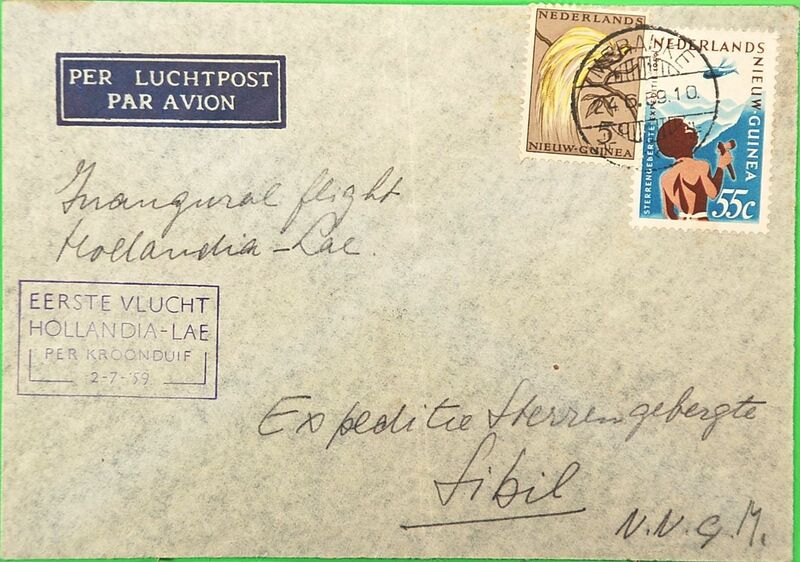 KNILM inaugural 'Kroonduif' flight Hollandia to Lae, and return, bs Lae 2/7 and Hollandia 4/7, violet boxed 'Eerste Vlucht/Hollandia-Lae/Per Kroonduif/2-7-59' flight cachet. Uncommon both ways cover, #'s P214,215, Eustis. 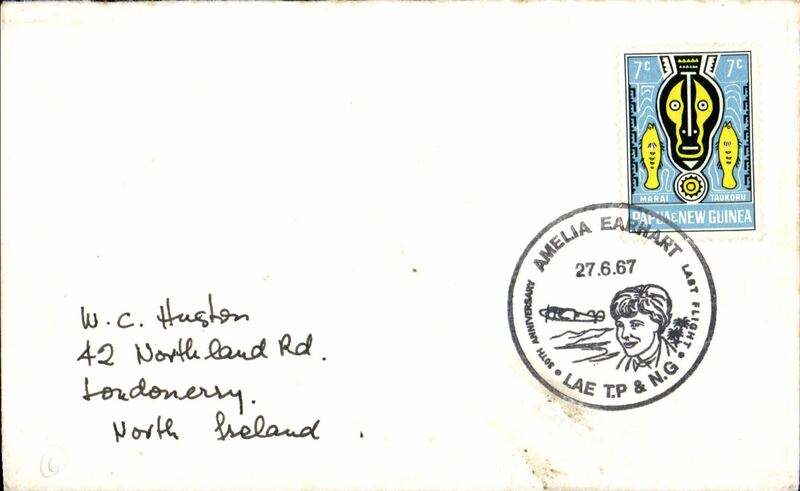 Cover commemorating 30th anniversary of Amelia Earhart's last flight Lae T.P. & N.G., commem date stamp tying PNG 7c. 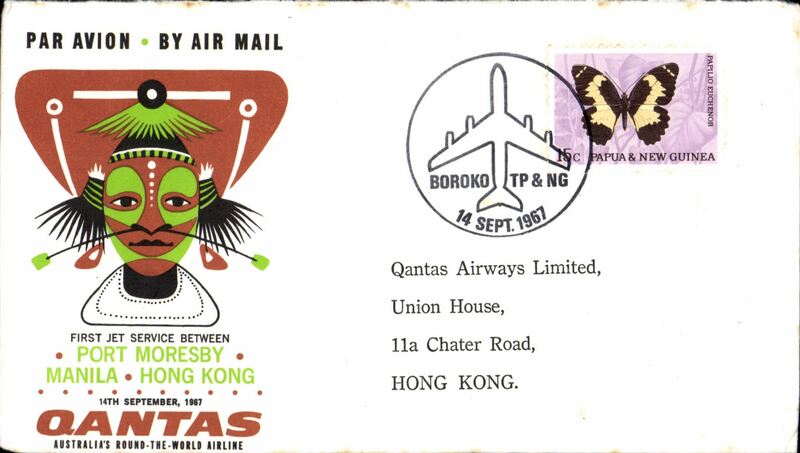 First jet service, Port Moresby to Hong Kong, b/s, official company cover, Qantas. 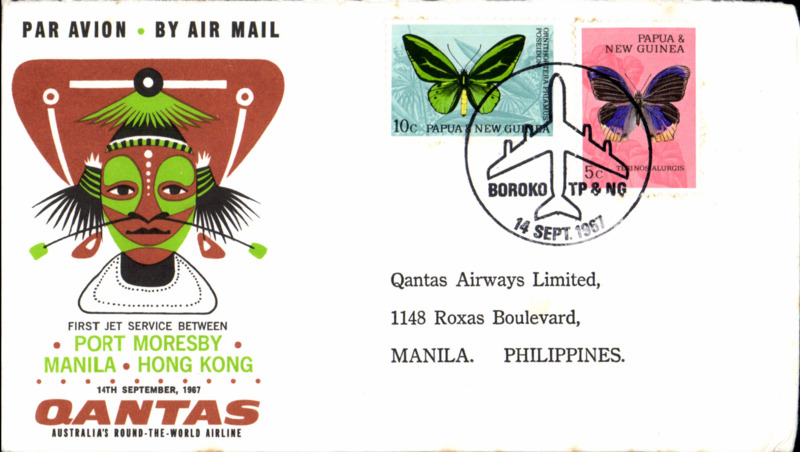 First jet service, Port Moresby to Manila, b/s, official company cover, Qantas. 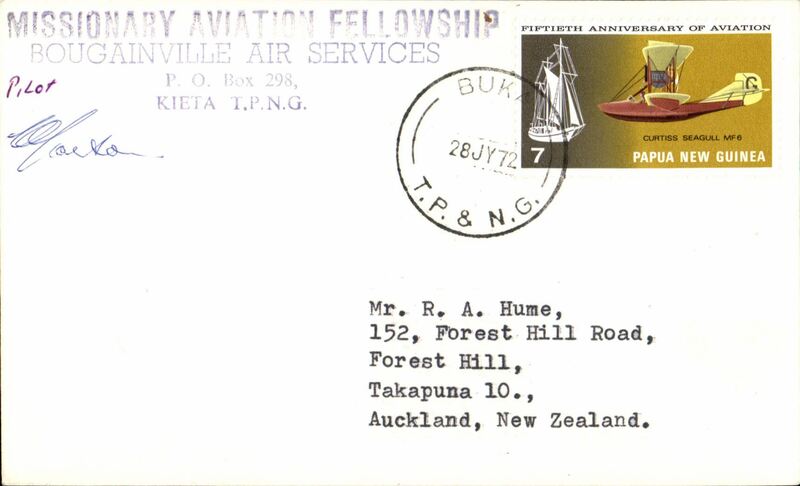 Missionary Air Fellowship, Bougainville Air Services, Kieta corner cover, Kieta to Buka, POA 28 JY 72 cds, signed by the pilot. 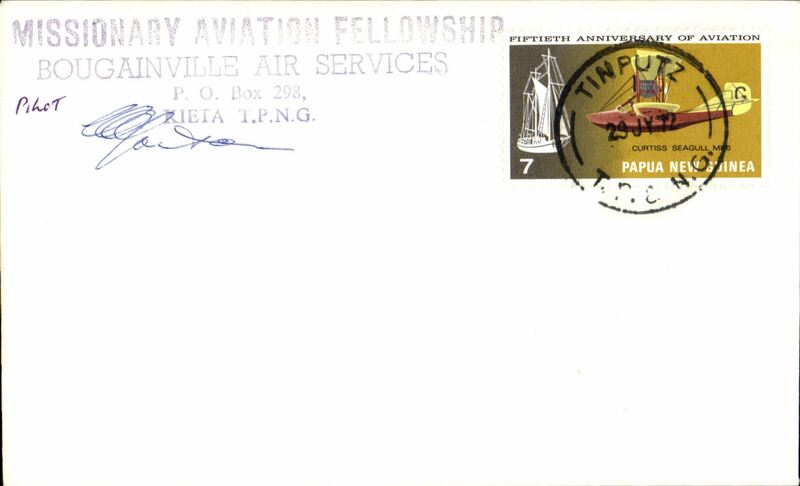 Missionary Air Fellowship, Bougainville Air Services, Kieta corner cover, Kieta to Tinputz, POA 29 JY 72 cds, signed by the pilot. 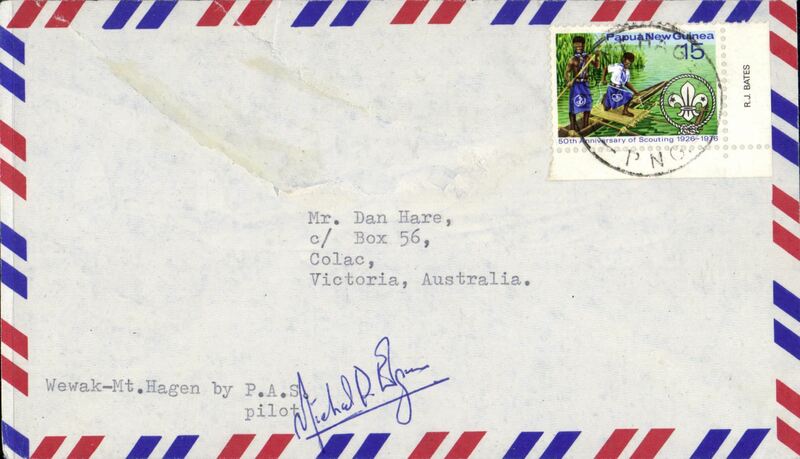 Provincial Air Services, Wewak to Mount Hagen, airmail cover franked 15c, POA 'Mount Hagen/PNG/ NOTE date illegible', signed by Michael D.Egan, Director. and also his business card.PAS is a mid-sized company serving industries in the Mt. Hagen area. 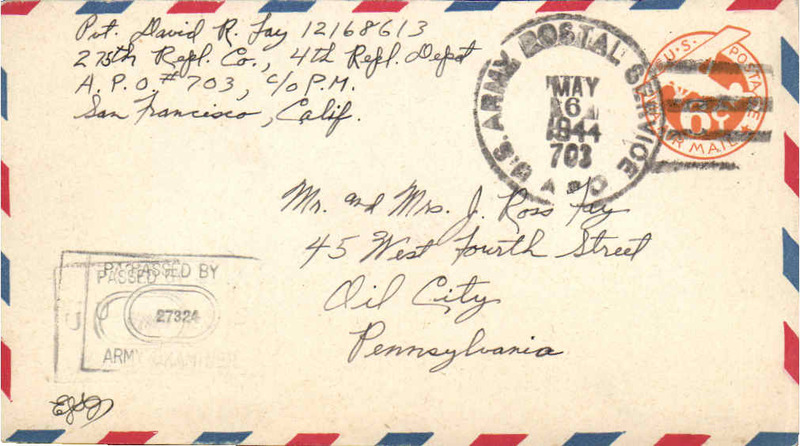 The year of the company's foundation has been entered as the postmark date is illegible. The cover has a significant closed frontal tear which has been neatly repaired, see scan. An interesting item none the less.